"The Infosphere" redirects here. For the Brain Spawn's memory bank, see Infosphere. The Infosphere is the largest Futurama knowledge bank on the web. It started on 30 January, 2006, as a side project of 'Buddy13'. The Infosphere still garners the attention of the fan base of Futurama as the best source for trivial, trivia and encyclopædic information about Futurama. 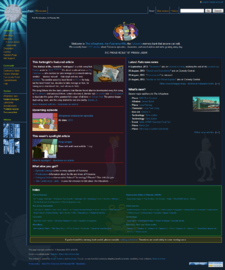 The Infosphere originally started as a minor side project by 'Buddy13' as a place for him to store anything he knew about Futurama, after finding that many Futurama fansites overspecialized or had gaps in their information. He decided on the MediaWiki platform, because it was at the time one of the simple solutions offered by DreamHost, the Infosphere's former host. The Infosphere grew in popularity, and generally appealed to more and more of regular members from PEEL, who would contribute to the wiki. The increase in popularity led to a change in URL as the then-current URL (futurama.overt-ops.com) was difficult to remember for the average visitor. 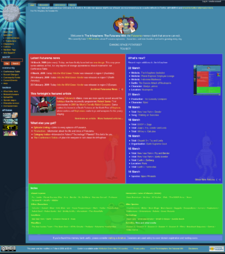 In late 2007, the site saw a layout change and standard change, which introduces infoboxes to the wiki as well as minor design changes for the wiki to keep it more stylish. During 2008, DreamHost took down the Infosphere because it was using too much CPU time on their servers, which were shared with others. The site was quickly moved to a short array of servers as a result. The Infosphere was moved back to DreamHost after an attempt was made at optimization, but it still wasn't enough, as DreamHost could not provide the required CPU usage the site needed. The Infosphere was temporarily placed on a server at the German Hexonet, hosted on a dedicated machine. Later that year, the site moved to a virtual machine, hosted from the same data centre. The only competition to the Infosphere has remained Wikia's Futurama Wiki. Wikia has at least twice proposed a partnership between themselves and the Infosphere. One of the arguments used by advocates of the Wikia supporters are better servers and lack of competition. However, the editors of the Infosphere have denied a possibility of a partnership with Wikia's Futurama Wiki, because it would involve too many restrictions for the wiki as it is. A key issue with the deal has been for the Infosphere editors the fact that Wikia is a for-profit organisation, which issues ads on its wikis, something the Infosphere would not like to see on its own wiki. The Wikia supporters on the other hand, suggested that the ads would encourage people to sign up and become a contributor, as the ads disappear when you log in. The Infosphere editors also moved that, despite their occasional server issues, they were doing rather well and were not in need of Wikia's servers. However, they did specify that the lack of competition would be nice, but also moved that the content of Wikia's wiki was too weak for the quality standard of the Infosphere, and sharing that content would best be avoided. Not to mention that the Infosphere's founder, Buddy13, still harbors resentment to the fact that the Wikia wiki made a habit of stealing their images directly from the Infosphere. It is unknown whether this practice continues. Since late 2009, early 2010, the Infosphere has remained in relative stability as its efforts to deliver a comprehensive guide to all things Futurama continue. However, the Infosphere has grown far more prominent in the press as a result of Futurama's return and its increased popularity. In fact, its prominence has gained the attention of writers of Futurama itself for reference purposes. In "The Why of Fry", Nibbler says that the Brain Spawn have been constructing the Infosphere for a thousand years, which suggests that the Infosphere was created around 2004. This wiki was created in 2006. ^ Rogers, Eric (26 April 2011). answer 2 question: we use the infosphere at least once a day in writers room.. (Twitter.) Retrieved on 06 May 2011. This page was last edited on 12 August 2018, at 07:42.